In July 1745 Bonnie Prince Charlie landed in Scotland with the intention of raising the clans and marching triumphantly into London where a popular uprising would proclaim his father King James III. It did not work out like that at all. The Jacobite army advanced to Derby but then withdrew to Scotland and was slaughtered at the Battle of Culloden. There was £30,000 on the Prince’s head and he was on the run. 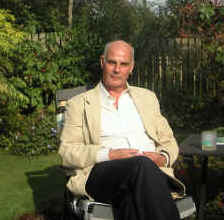 The author, Steve Lord, lives in Oxfordshire. He is married and has two sons at London University. In order to complete this journey Steve took a part-time contract with his employers. His wife thinks he is slightly mad. To whet your appetite please read the Introduction to the book printed below. 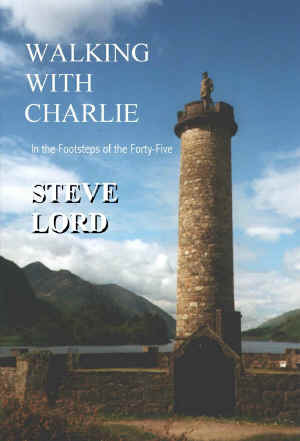 You may be interested to know that The National Trust for Scotland stocks the book at Culloden and Glenfinnan. The price in UK is £12.50 post free. Add £1.50 postage costs and we’ll donate it to the Electric Scotland website to help it continue its excellent work in promoting Scottish interest throughout the world. Signed copies are available in UK for an additional donation of at least £1.00 (all signature donations to Electric Scotland). If you require the copy to be dedicated to someone please provide their name! Overseas customers please visit the website. 14. Will Ye No Come Back Again? 1685 James II and VII crowned King of England and Scotland. 1688 James Francis Stuart born (son of James II). 1689 William of Orange and wife Mary (daughter of James II and Anne Hyde) crowned as joint monarchs. 1689 James (II) arrives in Ireland in the first attempt to regain the throne. 1690 James (II) defeated by forces of William III at Battle of the Boyne. 1694 Mary dies at the age of 32 leaving no children. 1701 Act of Settlement passed stating that no Roman Catholic may become monarch. 1701 Exiled King James (II) dies. 1702 William III dies aged 53 after falling from a horse. Queen Anne (Mary’s sister) ascends the throne. 1707 Act of Union passed. Great Britain comes into existence. 1708 James Francis Stuart, son of James II, unsuccessfully attempts to land in Scotland with 5,000 French troops. 1713 Treaty of Utrecht produces temporary peace between Britain and France and forbids James (III) the right to live in France. 1714 Queen Anne dies with no surviving children and George, Elector of Hanover is crowned George I. 1715 Jacobite rebellion led by the Earl of Mar captures Perth and Inverness but quickly fails through lack of French support. 1715 Louis XIV of France dies leaving Jacobites short of French support. 1717 James (III) takes up residence in Italy. 1719 Spanish financed Jacobite rebellion fails. 1719 James (III) marries Clementina Sobieska. 1720 Prince Charles Edward Stuart born in Rome. 1725 Charles’ brother Henry born. 1727 George I dies, George II is crowned. 1735 Clementina Sobieska dies aged 33. 1740 Charles VI of Austria dies, precipitating the War Of Austrian Succession. Britain and France on opposing sides. 1743 French lose Battle of Dettingen. Renewed French interest in anti-British and therefore Stuart cause. 1744 Invasion troops led by Prince Charles assembled at Dunkirk. Bad weather wrecks ships and plans. Charles determined to try again. 1745 In May the French rout British forces commanded by the Duke of Cumberland at Battle of Fontenoy. Bonnie Prince Charlie or Prince Charles Edward Stuart, to give him his more formal name, was convinced, with some good reason, that his father should be sitting on the throne of Great Britain. In July 1745 the Prince and a few companions landed on the west coast of Scotland in an ambitious and many would say foolish attempt to regain the throne for the Stuart family. 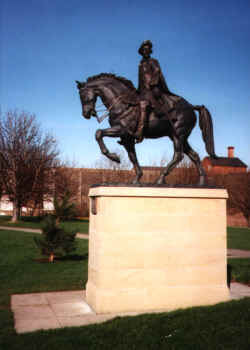 Gathering support as he went, Prince Charles marched south from the Highlands with the intention of reaching London where he had the romantic notion he would be welcomed in triumph. His father would be declared James III and the reigning Hanoverian king, George II, exiled. It did not work out like that at all. True, the Bonnie Prince marched a long way south but in the end failed to reach London. His army advanced to Derby but then retreated ignominiously. At Culloden near Inverness the rebel army was badly beaten and after many adventures Prince Charlie escaped to France, his dreams of kingship shattered forever. The 1745 campaign was the last of several attempts to restore the Stuarts to the throne and is often known simply as ‘The Forty-Five’. The story of Prince Charles’ exploits in Britain is famous throughout the world. Flora MacDonald, who helped him escape from the redcoat soldiers, over the sea to Skye, is almost as celebrated as the Bonnie Prince himself. The battlefield at Culloden, where Jacobite ambition was torn to pieces by British army cannon fire, is well visited and many people can sing at least the first couple of lines of ‘The Skye Boat Song’. The tale is one of intrigue, high hopes, heroism, personal charisma, bravery and fortitude as well as arrogance, unreasonable expectation, butchery, fear and failure. The adventure had a poor beginning, transformed for a time by battles won and cheering crowds, into majestic success against all the odds. Yet it is a story of disillusionment, imagined betrayal, pain, death and final defeat. It is also true. I am interested in history and I enjoy walking. It seemed like a good idea to combine the two by following the Prince’s route on foot, taking into consideration the modern development of the landscape and the availability of suitable footpaths. It is crucial to my family’s well-being that I work for a living and so finishing the walking in one continuous, foot-blistering slog was fortunately not an option. About ten days at fifteen miles a day is as much as my feet can cope with and, as I usually stay in B&Bs, the novelty of black pudding, bacon, sausage and mushroom breakfasts wears off after about a week. This journey is more than fifteen hundred miles from start to finish, many of them over rough and isolated territory. It would have taken me forever at the rate of a snatched weekend here and there. I had to reorganise my life to do it. I have completed the first half-century of life and on the assumption that another fifty years is a bit unlikely, I decided that the wheels of corporate globalisation would have to do without me for a while. My employers have the enlightened policy of allowing their staff part time contracts. The only snag is that they only expect to pay part time salaries but I soon became used to the idea. This ‘downshifting’, as the fashionable jargon has it, is a good scheme if you have the finances right. I have always tried to live within my income and save a shilling or two for the future. When is the future if not when the first fifty years are completed? The mortgage is paid off and the children are almost grown up. When a fifty per cent contract was offered to me, I discussed it with Momoyo and then grabbed it with both hands. I haven’t regretted it for a minute. I began at Loch nan Uamh where Prince Charles first landed on mainland Britain. It’s a wild spot just south of Arisaig on what is now ‘The Road to the Isles’. The walk took me through Perth, Edinburgh, Carlisle, Manchester and finally to Derby. The Prince was determined to take London but to his enduring disappointment his commanders decided that the odds against taking and holding the capital were too great and marched the army back to Scotland. I followed the retreat to Glasgow, Inverness and the infamous battlefield at Culloden. Defeat drove Prince Charles to the Hebrides but as the noose of capture tightened he was compelled to return to the mainland and hide for weeks in the wilderness of the western Highlands. The Prince’s adventure ended back at Loch nan Uamh from where he and a few companions finally escaped to France. It is neither sensible nor practical to walk everywhere so I thought about using my car and mused over other options. Circular routes are just the job for cars. After a good day’s walking you come back to the spot where you started and there is your personal transport and security blanket waiting to whisk you away to wherever your fancy takes you. Never mind that you’re cold, soaking wet and have not yet found somewhere to sleep. Who cares that the last bus has just gone and there isn’t another until a week on Wednesday? The car will see to it that everything is all right. Walking on linear footpaths is different. The car that was so useful for driving to the starting place would be not a scrap of good at the end of the day unless I returned to collect it. How would I do that? Walking back was out of the question and so hitch-hiking or telephoning for a taxi might be my only option. It all looked like too much trouble. I decided to leave the car at home and rely on public transport and the occasional lift. Many parts of Charles’ route have changed out of all recognition since the eighteenth century and so I deliberately travelled some of the way by motor vehicle. I hitch-hiked frequently but warn of the possible dangers. I did a lot of it when I was an impoverished student and most people who offered me lifts were friendly and helpful. There were a couple of occasions when the male driver placed an encouraging hand on my upper thigh. I didn’t much care for that and said so in a tone that made it clear that my gratitude might stretch as far as a cup of tea in a transport café but no further. There was also a notable time when a chap invited me to beat him with a springy tree branch on the slip road to the Forth Road Bridge. Well, I was with a friend, we were only eighteen and it seemed a harmless enough request to me at the time! If you do hitch, do it with a friend. At the risk of being branded a politically incorrect sexist, females would be mad to hitch alone. Be careful! The requirements of family and work meant that I completed the walk in stages over six years. I researched the Prince’s route before setting out on each part of my journey and chose the exact path to take on a daily basis. I used O.S. Landranger maps and walked on existing footpaths, disused railway lines, canal towpaths and minor roads. If you complete any part of this walk you will have an achievement on which to congratulate yourself. I wish you much enjoyment. The journey took me through glens and over mountains, across some of the wildest country in the land as well as over gentler terrain and into towns and villages. I am not a rock climber and so the walk offers none of the dangers associated with that activity. Much of the journey is through easy walking territory. Provided you are physically fit you could try it yourself and the qualities you will find essential are fortitude and no aversion to rain. Nonetheless some of the route is through the most remote region of Britain and took me considerable distances from roads and settlements. The Highlands of Scotland are thinly populated. Those who have never been there before will be amazed at the scarcity of towns or villages with any sizeable number of people. It is possible to walk all day in the more remote areas and not see anyone. A twisted ankle or worse would be serious problem for a lone walker and it could be a long time, perhaps even days, before anyone came along. The mobile phone, a sometimes-useful device in adverse circumstances, will probably not provide an operational line at the vital time. The weather anywhere in Britain, but particularly in the west of Scotland, is capable of rapid change. A beautiful day at nine in the morning might deteriorate into a howling gale by four in the afternoon. Appropriate clothing is essential and should include good, comfortable walking boots, waterproofs and something warm. The boots are important. Feet are going to ache after a while no matter what, but chafing boots that produce blisters are the last things anyone needs. I’m a great believer in wearing a hat but then I am somewhat ‘follically challenged’. A hat keeps off the sun and helps deter buzzing insects. A wide brim gives a split second’s warning of tree branches or other potentially painful objects. Yes, get a hat but not a baseball cap, and especially not one worn back to front. Buy a proper hat, one with a bit of style. You won’t regret it. Sun tan cream and insect repellent are useful and a plastic survival bag or similar protection might save your life if you’re stranded in a remote area. Carry a compass (know how to use it!) and a whistle and never walk without a suitable map. Acquire a decent walking stick. There are all sorts available, from expensive high tech affairs that look like ski poles to ones fashioned from bits of dead branch. A stick is useful for providing balance when crossing streams or difficult terrain. It provides additional leverage for uphill climbs or a little braking for downhill ones. Lastly, a stick offers some comfort when confronted with the barking dogs you are likely to encounter along the way. Try not to do too much in each day, particularly if you find you’re not quite as fit as you think you are. There is a commonly held view that a human being can walk at about four miles an hour, and for short distances, over smooth, flat ground this may be true. However experience tells me that I am hard pushed to do more than two miles an hour over the whole day and less than that in the more arduous areas of the Highlands. I admit right here, right now that there were occasions where I failed to follow in the Prince’s footsteps as closely as I should have liked. Some of the journey was hard and my plan was to enjoy the experience, not wear myself out. Time constraints, weather, personal motivation, fitness and perhaps even age conspired together to occasionally leave my achievements short of the ideal. However the reader may be assured that if I say I walked a particular route then I did so and if I did not then I say that too. I have tried to make my route clear without becoming bogged down in too much detail. However, my endeavours should not be regarded as the only way of completing the journey. There are often alternative paths. I prepared each day’s walk but still occasionally took the wrong path and had to backtrack a little. The secret here, I discovered, was to be vigilant with both map and compass. I checked my position frequently, especially when the slightest suspicion that I might be moving in the wrong direction crept into my mind. I decided not to book accommodation in advance, as I preferred the flexibility of taking pot-luck. Finding somewhere to sleep in the Highlands was occasionally difficult and so I left plenty of time each day to locate a place to stay. I considered camping, but not for long. I’m a bed and breakfast man. I do camp sometimes but only in good weather and in places where I can return to the site easily. I’m far too long in the tooth for carrying a heavy pack and never much liked it when I was younger. Camping is tremendous fun, cheap and you meet some super people but at the end of a hard day’s walk there is nothing like a hot bath and a comfortable bed. I mentioned earlier that the story is true; but is it? Certainly if the broad thrust of my version of the tale is examined in terms of dates, battles and principal characters then it is as true as the next writer’s. But the truth we perceive and hope to understand depends on how events are portrayed. We need to learn not simply the bare facts but the underlying motivation behind the action. We ought to see what happened from more than one point of view. These truths are more difficult to define. How did the ordinary soldier in the Jacobite army feel? What of the motivation of the various commanders or the attitude of the French? What were the reasons for the decision to retreat from Derby? Could the Jacobite army have regrouped successfully after Culloden? Who supported the Prince and why? There are endless questions and even more answers. Although I have tried to throw a little light onto events it is not within the scope of this book to delve deeply into these subjective matters. There are dozens of books on the Forty-Five for those who wish to further their knowledge and come to their own conclusions about the rebellion. Several factors may influence our perception of these events 250 years ago. The tourist industry long ago concluded that there is a lot of money to be made from the ‘Highlandisation’ of Scotland. Tartans, claymores, kilts, bagpipes and the like are on everything from whisky bottles to tea towels. These images are not only found north of the Highland line but throughout the country. The Royal Mile in Edinburgh has never been a centre of Highland culture or support but its shops are full of the stuff. The image of an masculine Highlander with rippling muscles, struggling against the odds to maintain his traditional way of life is an integral part of the hard sell. The portrayal of the Jacobite risings as plucky but unequal struggles against the English fits neatly into the mythology. The marketing people have a field day with the names Bonnie Prince Charlie and Flora MacDonald. If the kilted Highlander is thrown into the melting pot and we view the rebellion of 1745-46 through rose tinted spectacles, as we are encouraged to do, the resulting image becomes endowed with a mysticism that sells huge quantities of shortbread! Do we see the Bonnie Prince as a ruthless, vain, despotic prince who believes in the divine right of kings and is willing to sacrifice any number of people to achieve his ends? No we do not. We see a young, handsome, almost angelic prince who, very nearly single-handed, has come from afar to deliver his faithful Highlanders from poverty and oppression and avenge the wrongful exile of his grandfather king. In Flora, do we see a frightened young woman terrified of government troops but compelled by the authority of her visitors and a misguided sense of Highland hospitality to undertake her dangerous mission? Again we do not. We are encouraged to see Flora as a romantic heroine, perhaps a little in love with her handsome Highland prince. She is willing to risk her life to protect him from the wicked English in the furtherance of a desperate cause dear to her heart. The whole Flora MacDonald episode is overblown in the popular ‘faction’ version of the ’45. True, the woman played a useful role but she was only with the Prince for twelve days. Her prominence is attributable to the perceived romantic involvement and because she is one of only a few women to play active and significant parts. Collectively these images play upon our thinking and may convince us, without any good foundation, of the right of the Jacobite cause and perhaps persuade us that the Prince’s supporters were all Highlanders. It was in the British government’s interest to initially play down the importance of the Forty-Five and later transmogrify the image of the Highlander from a rebellious savage into that of patriotic British soldier fighting valiantly for freedom throughout the world. The belittling and denigration of the rising facilitated an atmosphere that precluded further unrest on behalf of the Stuart dynasty and was deemed essential for decades. The Prince’s army was portrayed as a hastily thrown together band of desperate men with little training and no hope of success. Highland dress was forbidden and the Highland way of life was depicted as flawed and dying in response to challenges of the Britain so recently born out of the Act of Union. Thomas Pennant, who was no Jacobite, made these comments during a tour of Scotland twenty-three years after the rising. The houses of the common people in these parts are shocking to humanity, formed of loose stones, and covered with clods, which they call devish, or with heath, broom or branches of fir: they look at a distance like so many black molehills. The inhabitants live very poorly, on oatmeal, barley-cakes and potatoes; their drink whisky sweetened with honey. The men are thin, but strong; idle and lazy, except employed in the chase, or anything that looks like amusement; are content with their hard fare, and will not exert themselves farther than to get what they deem necessaries. When the threat of renewed Jacobite activity was deemed to be over, the gradual rehabilitation of the Highlander into mainstream Scottish and British life took place. Sir Walter Scott’s Jacobite novel, ‘Waverley’ was published in 1814 and that was followed by ‘Rob Roy’ and other romantic Highland works. Caroline Oliphant who was the daughter of a prominent supporter of Prince Charles Edward wrote popular songs sentimentalising the Highlands in general and the Prince in particular. ‘Charlie is my Darling’ uncompromisingly illustrates the interest in romantic Jacobitism. Queen Victoria continued the process and gave the tartan a new respect and validity. The Forty-Five was coated with a syrupy veneer and portrayed as a wild, impulsive, almost teenage escapade. After all it was a long time ago, the Jacobites lost and the monarchy and country were safe and prosperous. The establishment could afford to be generous to a distant rebellion that no longer produced a moment’s disquiet in the drawing rooms of England. The ’45 is frequently described as either a rebellion against the legitimate British government of the day or a rising by supporters of a wrongly dispossessed royal dynasty to recover its rightful position on the throne of Great Britain. Sometimes the rising is portrayed as an ‘England v. Scotland’ contest as though it were a football match. Clearly this is a simplistic and inaccurate representation of the conflict. Although it cannot be denied that government support was mostly English and Welsh while Jacobite support was mostly Scottish, neither side drew their assistance exclusively from these sources. The custom of referring to Prince Charles’ forces as the Highland army is understandable but erroneous. Highlanders were the biggest single group in the Prince’s army at all times and as the high points of the campaign might be seen as the Battle of Prestonpans and the advance to Derby where the majority of the marching army were Highlanders the popular description may be excused. Prince Charles is partly to blame as he adopted Highland dress as the standard uniform for his army, even providing the Manchester Regiment with white cockades and tartan sashes. However, there were English, French and Irish in the army and not a small number of Lowland Scots. Gordon of Glenbucket and Lord Pitsligo each recruited several hundred men from the Aberdeen and Banff regions where Episcopalianism, with its concept of the indefeasibility of kings, was strong. Lord Ogilvy produced 600 or so from Angus and John Roy Stewart led the Edinburgh Regiment. The second line of the Prince’s army at Culloden contained more Lowlanders than Highlanders. Rivalry between the Highland regiments in the front line was intense and clansmen would take orders from their own chief but not from any other. To resolve these difficulties overall command of clan regiments fell to The Duke of Perth and Lord George Murray. It is similarly incorrect to believe that all or even most Highlanders supported the Prince, let alone did any fighting for him. The memory of how previous Jacobite risings had ended and the arrival of Prince Charles with almost no support did nothing to convince clan chiefs that enthusiastically rallying to the Jacobite Standard was a great idea. The chiefs of the MacDonalds and MacLeods of Skye ignored the pleas for help, as did Lord Seaforth, leader of the Mackenzies, despite the fact that his clan had been ‘out’ for the Jacobites in 1715. Indeed it can be argued that few of the western clans came out en masse to support the Prince and it was not until the Jacobite army entered Perth that its numbers matched those of the ’15. The popular image of the rising does not encourage the casual observer to believe that the government attracted much Highland support other than that raised by The Duke of Argyll and his cousin General John Campbell of Mamore. However, Duncan Forbes who was the most senior government officer in Scotland spent much time and energy raising twenty independent companies of Highland militia composed of MacDonalds of Sleat, MacLeods, Grants, Munros, Rosses and Gordons. Finally, it is sometimes said that more Scots fought on the ‘English’ side at Culloden than for ‘Scotland and Prince Charlie.’ This is also untrue. Of the 9,000 men who fought in the government lines at Culloden about 2,400 were Scots. These were predominantly in three regiments: The Royal Scots (1st), Campbell’s Royal Scots Fusiliers (21st) and Sempill’s King’s Own Scottish Borderers (25th). In addition there were the Argyll Militia and Lord Louden’s men. Of the approximately 5,000 men fighting in the Prince’s lines most were Scots with the notable exceptions of the Irish Piquets, the Manchester Regiment and the Régiment Écossais Royaux.